In the last days perilous times shall come. ... men shall be lovers of themselves, covetous, boasters, proud, blasphemers, disobedient to parents, unthankful, unholy, Without natural affection, trucebreakers, false accusers, incontinent (without self control), fierce, despisers of those that are good, Traitors, heady, high-minded, lovers of pleasure more than lovers of God; Having a form of godliness, but denying the power thereof: from such turn away (2 Timothy 3:1-5). ...but he shall come in peaceably, and obtain the kingdom by flatteries. And such as do wickedly against the covenant shall he corrupt by flatteries: but the people that do know their God shall be strong, and do exploits [take action]. (34) ... but many shall cleave to them with flatteries (Daniel 11:21&34). Also in CETF 40 we reported on the amazing CATCH the FIRE National Day of Thanksgiving (May 26, 2007) meeting at which self-confessed sexual abuser the late Frank Houston was honoured. I am sure we have not heard the last of this outrage. We will plan to keep CETF readers informed. 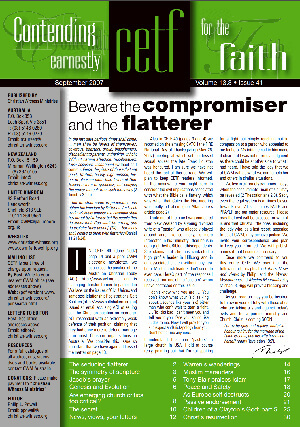 In the meanwhile you might care to consider the evil implications associated with what the Bible calls flattery, which was what that Catch the Fire meeting was really all about (see Allan Jenk’s article). I don’t know who you are … You don’t know what your (sic) talking about…sounds like your (sic) bitter man who can’t wait to start a fight. … To (sic) bad I can’t meet you and tell you to your face you, sound like Judas to me. Now I will pray for you and expect and (sic) apology from you. Don’t bother me anymore. I understand this man “pastors” a large church in USA. I did of course reply, pointing out that I’m not spoiling for a fight but simply reaching out in compassion to a person who appealed to me for help. My initial email to him made it clear that I was not making a judgment as there could be another side to what I had heard. I have told the lady that we at CWM will do what we can to help her and others in similar situations. We live in extremely evil times—days when the consummate “man of sin” may be revealed (2 Thessalonians 2:3). Sadly even the legal system is at times biased towards evil. At such times FAITH and PRAYER are our major resource. Please pray that evil will be exposed for what it is and that Christ’s little ones, including the lady who, as a last resort, appealed to us at CWM, may achieve justice. We invite your correspondence and plan to keep you informed. We will publish names if that becomes necessary. Once more we commend to you this entire CETF. We pray that the following articles plus the Letters, News and Views by Philip, and the Warren Wanderings and Muslim Maurauders by Michael B. Bigg will prove a blessing and challenge. As you read on may you be inspired to throw in your lot fully with those of us who are taking a stand against today’s evils and for a purified ministry and Church. Christ is coming SOON! Let us be glad and rejoice, and give honour to him: for the marriage of the Lamb is come, and his wife has made herself ready (Revelation 19:7).